A BC native, I have always had a passion for nature and connecting with the softer, slower pace of life - behaviour my husband has termed “the BC hippie”. I moved coasts in 2005 to attend Dalhousie, where I graduated in 2009 with a Bachelor of Science in Kinesiology, quickly followed by massage therapy training in 2012. It was at that point my husband and I decided to leave Halifax in search of the perfect place to start family, and Wolfville was the winner! After working for a physiotherapy clinic for two years, I moved my massage practice to our home; four years and two beautiful girls later, I still practice from home and love it. Yoga has always been a passion for me, but it was after the birth of our first daughter (she was colic for 6 months) that I realized how integral it was in my life. What had started as an escape, soon evolved into a necessity, almost as important as breathing. Soon my husband was making comments like “you aren't going to miss yoga are you?” and “I’ll do whatever I need to, to make sure you get your yoga in.”, so clearly a positive change was happening. I knew I wanted to bring this experience to more people, and after completing my yoga teacher training in the spring of 2018 with TAYS out of Halifax, the stars aligned and I was able to bring YogaLife to Wolfville. I am currently working towards my 500hr yoga teacher training and have taken additional classes in Yin and Yoga for Seniors. My goal is to provide a very therapeutic experience in all classes you take with me - I hope you love it! I first discovered yoga as a compliment to the physically demanding nature of work in the agricultural sector... yoga proved both restorative & fortifying for my body, mind & spirit! I recently completed my 200 hour teacher training at the Yandara Yoga Institute in Mexico which focused on Hatha, Vinyasa Flow, Slow Flow, Yin & Restorative practices. With over 10 years of personal practice, I am looking forward to sharing my love of yoga with students. At YogaLife, I'll be offering a Slow Flow Vinyasa class which helps one to really internalize and make that mind/body connection while moving through a physical practice. Off the mat, you’ll find me working as a vineyard manager & fibre artist here in the Annapolis Valley. My love of Yoga was ignited when I was at my lowest. It was the one consistent practice I had that kept me from completely giving in to my self destructive patterns. Through Yoga I was able to connect to the real me. I was able to slow down, breath and listen to my body. It was my time to listen, reflect, and release thoughts and emotions that were no longer serving me. This new found love inspired me to want to help others overcome their challenges. I completed my 200hr teacher training in June 2018 with Grow A Lotus, which focused on Alignment based, Hatha Yoga. 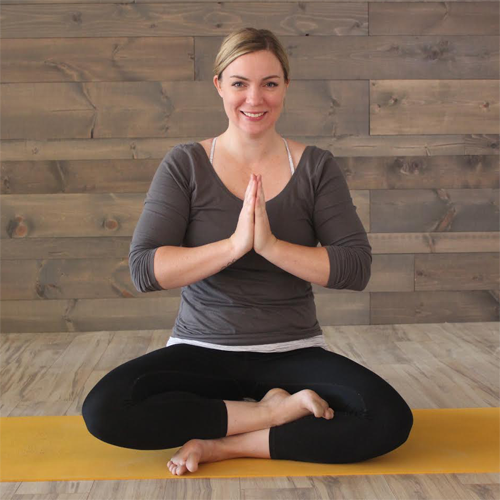 At YogaLife, I look forward to sharing space and guiding my students through a playful Align & Flow practice that infuses alignment principles with flow sequences. My classes are meant to encourage self awareness, acceptance and strength while challenging you to slow down & listen to your body. Yogalates: Why infuse yoga classes with Pilates? Hmmm, for me, it helps me: 1) listen to my body…and hear it; 2) inhabit my body in a way that is more self-aware; 3) care for my body more lovingly, respectfully, and effectively. What’s Pilates? It’s a mind-body practice created by Joseph Pilates almost 100 years ago, made famous for helping ballerinas, athletes and celebrities feel taller, look longer and leaner, become stronger and more aligned, self-aware and focused. Why am I so passionate about Yogalates? It’s been key for me to remain physically active and open-hearted; to recover from a compressed body and stressed mind; and to keep deepening the connection with my core, and with Nature. My Wintertime addiction? Daily barefoot yoga in the snow/ice on our deck by the ocean…a mind-body practice! How I hang out? Anti-Gravity Yoga at home! I was taught Anti-Gravity Yoga by its NYC creator, Christopher Harrison (check online!). I love doing the acrobatics…and adore Savasana suspended/cocooned in the silk. My fave retreat? Yoga/Pilates with Alex Estornel in Santorini, Greece was a terrific opportunity/challenge because…Alex was trained in authentic classical Pilates (!!) as a professional dancer in L.A. (he danced with Cher, Jennifer Lopez, Gloria Estefan…). Who Taught Me? I am ever-grateful to have earned my yoga teacher certification from Gloria Latham, the founder of Semperviva Yoga Studios in Vancouver, and Semperviva International College of Yoga, together with Sarah Cutfield, Semperviva’s Director of Yoga Teacher Training. I treasure my time immersed in the Essential/Intermediate Matwork Pilates Teacher Training certification course taught by Kim Kraushar, Master STOTT Pilates Instructor Trainer and founder of MindBody Fitness at the Interlude Spa (N.S.). My heartfelt intention? Supporting diverse students’ practice in a caring way with a joyful spirit. I started practicing yoga regularly when I turned 50, and it was life-changing. After a year of almost daily practice I felt like I had a whole new body—I was stronger and more flexible, with much better posture and physical coordination and endurance. I also began to experience a calmer mind, a gentler attitude, and a general contentedness that I’d never had before. Yoga improves my life in so many ways, I am motivated to share it. I believe yoga is for everyone, regardless of age or ability, and I make sure my classes are enjoyable and challenging for all students. I use props—chairs, walls and blocks—to help you experience the full benefits of yoga postures and sequences in a safe and supported way. In every class I cover joint mobility, flexibility, balance, strengthening, all supported with mindful breathing. My classes are gentle, but they’re not wimpy! I encourage every student to find their own “edge” where they can challenge themselves physically and mentally. If you think you’re not flexible/strong/mobile enough to do yoga, my classes are for you. I became a certified yoga instructor in 2012, after completing a 200-hour yoga teacher training with MYOGA’s one-year apprenticeship program in Wellington, New Zealand. I have also completed a 35-hour Kundalini Yoga training at Semperviva in Vancouver. Perseverance. Gratitude. Compassion. As a Calgary-raised competitive cheerleader and avid runner, my life was fast paced and in a state of constant rushing. I was no stranger to the continuous go-go-go mindset. My Bachelor degree of Science in Nutrition and Kinesiology at Acadia is what brought me across the country to the small town of Wolfville, Nova Scotia. The humble and laid-back lifestyle of Wolfville grew my appreciation for taking time to slow down, become mindful and to be present in each beautiful moment life has to offer. “Beer Yoga with Katie Mac” at Wayfarers Ale Society is what kick-started my yoga teaching career. In my classes, discussion and laughter are not only allowed, but are encouraged. By creating an upbeat environment and fun social experience, I aim to foster a sense of community in practice. Hot power flows are what set my soul on fire and I hope it translates into my classes. Prioritizing physical and mental well-being is infectiously inspiring to me and I believe one sweat can change your entire day, outlook or attitude. If you’re searching for a vibrant flow with some fun tunes and laughs meet me on the mat on Thursday nights at 8pm.